Tag (not real name) was a 59-year-old man from Indonesia. In April 2011, he had coughs with itchy throat. He went to see his doctors and was give medication but these did not help. In August 2011, he came to Penang for further consultation. 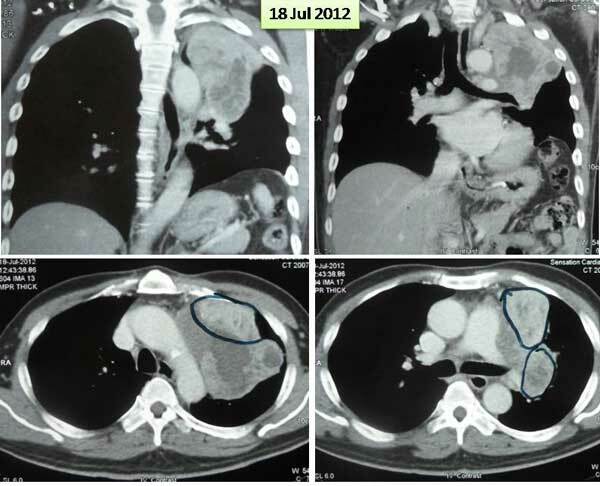 A CT scan on 22 August 2011 showed an irregular mass (6.6 x 8.0 cm) in the upper left lung extending to the pulmonary hilum with left hilar and mediastinal adenopathy. He also complained of pain in the left pelvis. MRI done on 6 September 2011 showed lesion at the body of C6, body and left pedicle of the L5 vertebra. This was probably metastatic in nature. The doctor said Tag had a Stage 4 cancer. Subsequently Tag underwent 5 sessions of radiation treatment to his neck area. He also received Zometa injection and the oral drug, Tarceva. But later EGFR testing showed no mutation so Tarceva was discontinued. Tag underwent chemotherapy with Alimta (Pemetrexed ) plus cisplatin. Tag was told that chemotherapy would not be able to cure him but would prolong his life. He was told he had 6 months to live. After radiation and chemotherapy Tag seldom cough and the pain in the cervical and lumbar vertebrae nearly disappeared. Microvessel interventional chemotherapy using Alimta + cisplatin and nano material. Iodin-125 seed implantation under ultrasound guidance – 10 seeds were implanted in the lymph nodes. All done, the treatment in China consisted of 5 cycles of chemotherapy, 2 times of cryotherapy and one Iodine seed implantation. The treatment was spread over a few visits, each lasting 1, 3 or 6 weeks. In March 2012, Tag returned to Indonesia and continued to receive chemotherapy with Alimta at the local hospital. In August 2012 Tag returned to China again. After receiving one cycle of chemotherapy his condition “dropped” (worsened). He was asked to go home to Indonesia. Not satisfied, Tag came to Penang again – to be hospitalized in the same hospital that he had received his first treatment. His main concern was his elevated leucocytes count. He was rather obsessed with this high number. He was only given antibiotics infusion because he refused anymore chemo-drugs. In spite of the antibiotics Tag’s leucocytes count remain stubbornly high. In the meantime while in the hospital, Tag’s wife came to CA Care and asked for our opinion. 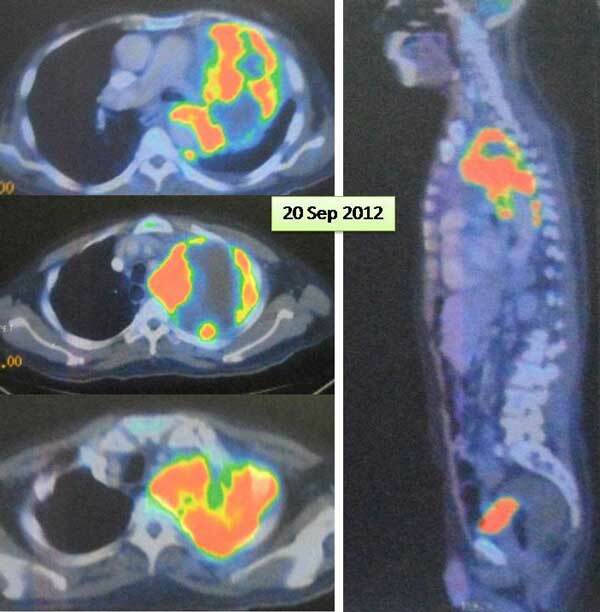 The following are the images of his CT and PET scans. Based on his medical history and failed medical treatment, I told Tag’s wife to learn how to accept and face reality. There would be no cure. And for him to come to Penang and check into a hospital trying to reduce his leucocytes count was surely mind boggling! He was barking at the wrong tree! Perhaps this is what Professor Jane Plant meant when she wrote, Conventional cancer treatment can process patients to the extent that they no longer understand what is really being done to them. They have lost the ability to think rationally! They come wanting to only hear that they can be cured. Tag’s wife told me that after a few days on antibiotics infusion, the doctor planned to do a PET scan. I objected to this idea. What is the whole rationale of doing scan over and over again? Know that all these procedures are not good for cancer patients. Do it only if it is absolutely necessary. Just two months ago, you did a CT scan. Now you want to do it again. What do you expect to see and get? I advised her to bring Tag home as soon as convenient. And if he was agreeable to take herbs, then he can start on our therapy while at home. If he were to stay in Penang, he would have problems cooking, preparing the herbs, etc. It would do him a lot of good to stay home in a familiar environment. Unfortunately, the next day my wife received a SMS informing us the Tag would want to go ahead and do the PET scan! A few days later, Tag and his wife came to our centre after being discharged from the hospital. No, his stay in the hospital receiving the antibiotic infusion did not do any good at all. Then Tag complained that his arm was painful after the PET scan and asked if I have any herbs for this. My answer, Go back to your doctor and ask him to “repair” you. After some days in Penang, Tag and his wife went home to Indonesia with a supply of herbs. Sometime later, I received an email from his son informing that Tag had gone into a hospital in Jakarta. He still complained that his leucocytes count was high! After a few days, his son wrote to say that Tag did another PET scan and this time he was concerned with the infected lymph nodes in his neck. Reply: Hello B. Sorry for taking so long to write you. I have been busy with so many patients needing my attention. Okay about your relative. I am afraid it is difficult for me to say anything or help. He did not follow my advice. Even when he was in Penang he was in the hospital trying to make his leucocytes count lower!!! I told him you are doing the wrong thing in the wrong hospital. When the doctor wanted to do PET scan his wife SMSed my wife. I told him earlier not to do the PET scan.but the next day he did the PET scan! After he went home to Jakarta his son wrote that he had another PET scan!!! 23 October 2012: Prof, thank you for your reply, but unfortunately patient died last week in a hospital. He had been in ICU for 1 week. 2. Difficulty to recognize that doing nothing could be a better option! The behavior of this patient really puzzled me. He came to ask for our opinion. He wanted to try our herbs, but he would not listen to what we say. There is no reason for such person to come and see us in the first place! Even more so, this man had done all the medical treatments and nothing had helped him. But why go on doing the same thing all over again? In trying to understand him, I asked, What is your occupation? This is one question I would never my patients, especially during the first visit. To me who you are is not relevant and I don’t want to be bias or influenced by your answer. But in this case I thought by knowing what he is will shed some light about the attitude of the person. His answer: I am an administrator in the government. That explains it all. I told him, Your job is to make people follow rules. If they don’t follow what you say, you give them “hell.” You follow the rules handed down to you without questioning. You can do that with the human beings that you “administer”, but unfortunately cancer in you does not behave according to your wishes or rule. You have cancer in you and you want the leucocytes count to come down – by just decreasing that number does not cure you at all. I told you not to do the PET scan but you did it anyway because the doctor said so! You follow “the authority“ like you do in your job. Unfortunately it does not work when it comes to cancer. 3. Not all patients who come to us find healing! There is none here, because the best doctor is found within you. We too wish to find the best, that is the best patient. For it is with the best patient that we can both find healing together — for you! Tag came to us after knowing that the father of the lady doctor above recovered from his lung cancer. This man had cancer in 2010, a year earlier than Tag. His cancer is more advanced than Tag’s –having spread from his lung to his brain and bone. Yes, this man is still doing fine as of this writing. Why does he not die likeTag? It is because he chose “to do nothing.” Doing nothing does NOT mean that you go home and wait to die! It means you do not need to follow “the so-called established authority” and follow what they tell you to do. Dr. B’s father refused to “medical authority”. He went for alternative therapy. Unfortunately it did not work out well at first. He went down to the bottom of the pit before he found CA Care. That was when his two daughters flew to see us in Penang asking for help. Daughter B is a medical doctor and we agreed that we should work together and avoid as much invasive and toxic treatments as possible. The patient recovered. We just have to learn to understand him!